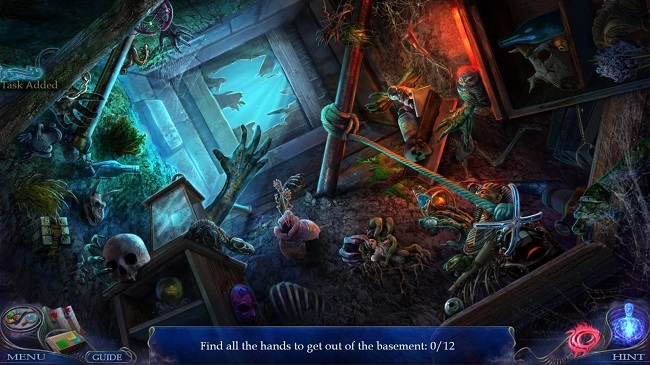 GrandMA studio is yet another in the line of “HOPA studios that don’t seem to have websites”. I’ve found a Facebook page but that’s it. Much like Vendel Games, they don’t seem to exist outside of Big Fish. It’s made me wonder if they’re not just another arm of Big Fish cleverly hidden under another name for tax reasons… or something. Because let’s face it, in an age where even your grandmother might have her own website, for a studio that’s made 14 games, possibly more that I’m not aware of, it’s almost criminal to not have a site. There’s also the fact that both studios feature a cat in their logo. Coincidence? I think not! Semi-joking aside (I’ll be looking into this! ), much like Vendel, GrandMA games has been around for a while now and like their mysterious Vendel-counterpart, have two franchises for which they are primarily known: Reflections of Life and Whispered Secrets. Both franchises that have somehow become pretty well known in the HOPA world and yet no-one really talks about them. And today I’m gonna do nothing to set that right because I’m more interested in their third franchise: The Unseen Fears. Having just stepped off your flight to Amsterdam, you get a call from an old friend asking you for help in a murder case that has left the police stumped for months. Hoping that with your special abilities, you’ll be able to see things that regular police missed, you’re asked to come to the latest crime scene where a gruesome sight awaits you. For these are no normal murders, these are very much of the supernatural variety. I wasn’t sure what to expect when I booted up “The Unseen Fears” as I couldn’t remember ever playing any of GrandMA’s games. I’ve definitely known about them for a while, they’ve been popping up regularly for the last few years. And I’ll admit I’ve been curious about them but never enough to prioritize them over any other games out there. Most of my curiosity comes from simply wanting to know more about the different HOPA franchises out there and any franchise that can hit seven entries definitely has my interest. But this time it was not “Whispered Secrets” that caught my attention but rather “The Unseen Fears”. I’ve actually had this game for a while now but never gotten around to playing it so when I decided to take a peek at GrandMA’s games, it was the most obvious choice. Probably for the best too as this game had me hooked from the start. Greeted by a pretty neat intro, the game then took me on a quick tour of some pretty cool scenery set in Amsterdam which impressed me to no end. Plenty of vivid colors immediately energized what could have been an otherwise dull environment, neon colors popping from an otherwise drab blue and yellow background. The contrasts were fabulous and how it should be done. 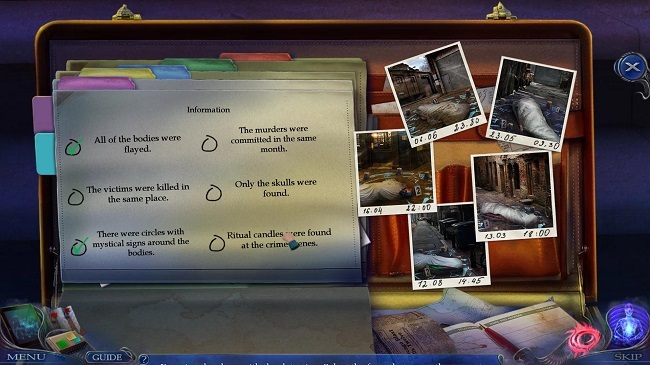 The game also won me over immediately when the first thing you did was put together a casefile on the victim, finding DNA samples and fabric pieces to help the investigation. And then you get to help the detective put together a victim profile, how the killer operates and what similarities there are. In other words, if you’re making a detective game, this is how it should be done. Unfortunately this doesn’t really come up again through the rest of the game, instead changing gears and throwing you into what is pretty standard fare for HOPA these days. Strung along on a series of locales, they soon quickly lost all impact since I knew they wouldn’t be very permanent. I never found a location boring or ugly, just not as impactful as those first few scenes when you’re actually investigating the murder, not just following the breadcrumbs dropped conveniently for you to follow. I’ll get into what I would’ve preferred a little later cause I don’t want to make it seem like I don’t appreciate the graphics of this game cause I do. 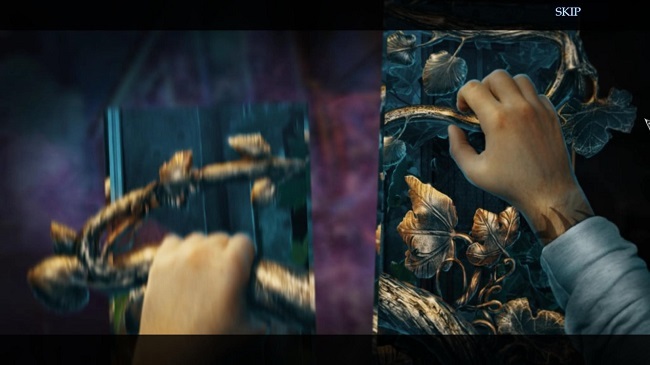 If I have a genuine complaint about the graphics, it’s that the animations really stood out as… not very good. Maybe that was intentional or a side effect of what ever animation process they used or the file format, but it really stuck in my eye. There were two types of cutscenes: fullscreen videos and “comicbook inspired” ones. Rather than showing the entire sequence of events play out in fullscreen in front of you, the game instead cut the video up in manageable little segments, jumping from “box to box”. A taxi arrives in one box, the next box pops up with the protagonist’s face, cut to a box of the cellphone ringing and being picked up. That sort of thing. This is a method that more HOPA studios should adopt since it’s clear they simply can’t stand up to the scrutiny of modern players. In an age where AAA studios spend millions on actual actors and motion capturing, weird face animation and paper cut out dolls just aren’t good enough. However, this method allows you to mask a lot of these issues by simply avoiding them while still looking very stylish and impactful, especially with some of the flair that GrandMA put into them. Unfortunately they didn’t stick to this style and every so often we’re forced to sit through some fuzzy, fullscreen video that just didn’t work as well and weren’t particularly engaging. They definitely fulfilled their purpose but I’d like to think we can do better. There was another kind of cutscene, what I usually refer to as “Storybook cutscenes” but sadly these were only used once or twice throughout the entire game. I say sadly because they were gorgeously drawn and animated, another fantastic way of circumventing the potential limitations of 2D or 3D animation. On the other hand, you don’t want to stop trying to animate properly, there’s no other way to get good at it, perfecting your craft. There’s ways to do it while hiding you’re not very good at it. Embrace your limitations and find ways around it, is what I’m saying. But, again, that’s my one complaint about the graphics and as complaints go it’s pretty minor. It just seems big because it’s the only graphical thing I can complain about. In truth these guys remind me of a young Eipix or Mad Head so if I go further back in their library and find they used real actors, I wouldn’t be surprised in the least. For all intents and purposes, the Unseen were mostly “unseen” because they stayed out of sight, not because they hid themselves magically. It’s less unseen and more hidden. The only way this tied into the game on a mechanical level was with “the sight” or whatever you want to call it. Basically an ability that allowed you to see magical stuff but sadly it didn’t really do much more than reveal what was, for the most part, already out in the open. It made things glow but sadly the game mostly just told you when to use it flat out so there was never this sense of “Oh, maybe if I use the sight here…” then the pleasure you get from having figured it out. Most times I just triggered it by accident because the game helpfully does so whenever you interact with an area that requires it. So before I had any chance to process it, the cursor changed, I click and presto, I now saw the “Unseen”. Which most of the time were just scribblings on the wall and neon smears. What I did like initially, however, was that the game came in two modes: Normal and Thriller. I was unsure what this actually entails as you’re asked to choose as soon as you start the game and the description was just kind of vague. What I understood it as was that one mode was scarier than the other. So obviously I chose the scary one and at first, that’s exactly what you got. Hands suddenly springing out at you, ghosts appearing randomly and seeing scary faces in screens. Don’t get me wrong, I wholeheartedly applaud this mechanic though I’m not sure why they felt they needed to make it optional. It was possibly the most supernatural thing about the game so playing without it would’ve made it less of a good experience. Ultimately they amounted to little more than jumpscares and while a few of those can be effective, it happened with rather alarming frequency and in places where it didn’t really do anything. 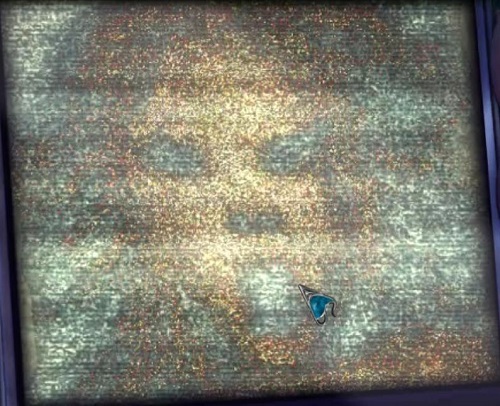 I’d have to play the game again just to see what was actually part of Thriller and what was just part of the plot but after a while you just became desensitized to cockroaches darting away from objects and spiders crawling across the screen. Jumpscares can be an effective tool to get your adrenaline pumping and heartrate up but they have to be used effectively and rarely or they quickly lose what makes them terrifying. I also have to consider that maybe there could’ve been a better way of using such a setup. Instead of just jumpscares, perhaps the Thriller mode comes with more violence or gore. Or perhaps just elements that makes an environment more spooky or scary, like the eyes of a painting following you around the room or perhaps these “Unseen” take on a more frightful appearance in Thriller mode where as in the Normal mode they look far friendlier. But let’s not dwell on the negative too much, I make it sound like I disliked the game which I did not. 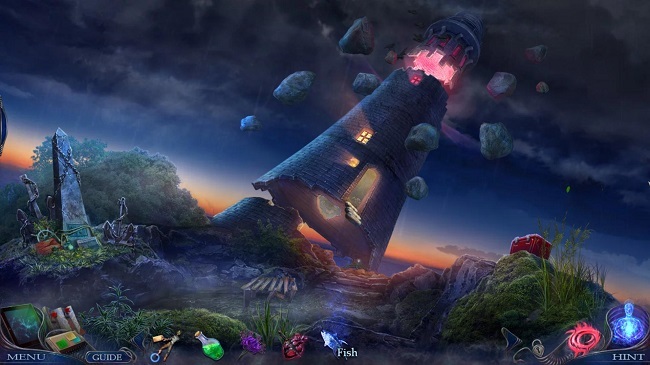 Let’s talk about perhaps the most overwhelmingly positive thing the game did: the hidden object scenes. 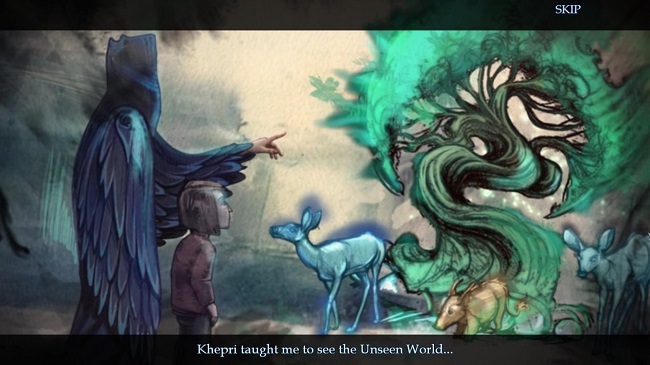 For long stretches of time I almost forgot that the game was a HOPA. Not in a bad way, obviously if you’re playing a HOPA, you want to play a HOPA. 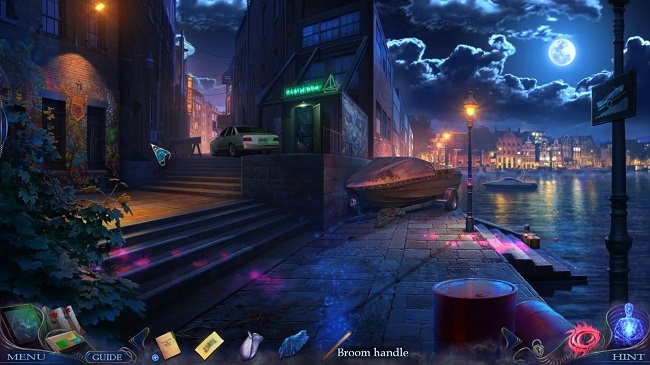 But this game so effectively hid its hidden object scenes that they felt far and few inbetween. 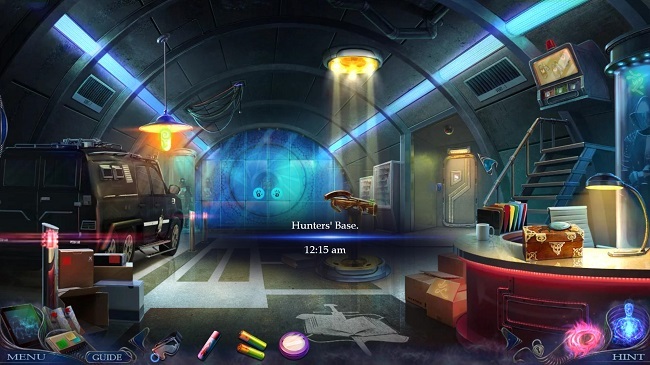 When playing the game, I was already writing the review in my mind and one of the things I thought was “It’s not really a HOPA, is it?” but as I continued to play, I realized the game had in fact been tossing me hidden object scenes pretty much constantly. It’s just that for every typical scene based on a list, you got something far more creative that felt like a mix between a minigame, puzzle and hidden object. 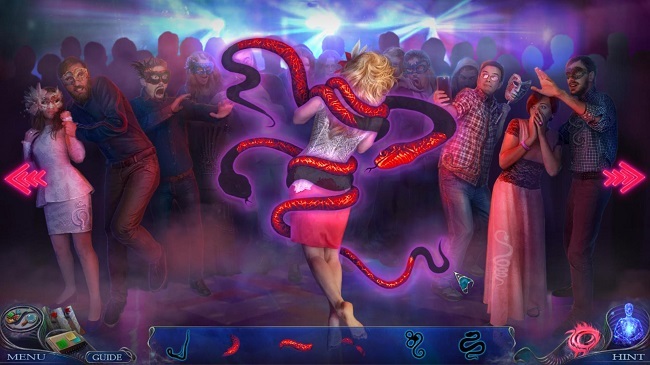 That scene in the club where you put together the red snake, pictured above, just absolutely floored me in how creative and well done it was despite not mechanically being that different from anything that’s been before. But sometimes it’s not a matter of reinventing the wheel but rather just taking what came before and using it in new ways. 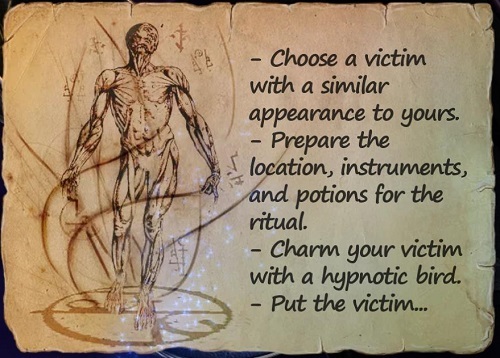 Many of the scenes in “Unseen Fears” benefited from this way of thinking and every so often the game just gave you a normal list-based one. Which actually made them feel that much more special and welcome. Of course, with everything positive I say there’s almost always a negative aspect coming up. In this case it’s the puzzles which… weren’t all that good. Some were good, some were average but quite a few were just not… good. I won’t say bad, that’s such a subjective term but it did contain many things that I just don’t like. The overly complicated locks where there really isn’t a wrong answer or simply giving me the combination to a lock then asking me to fill it in. Look, Developers in General (DiG), if you’re gonna present me with a combination lock but then require me to find the combination, then don’t ask me to enter it myself. It’s tedious and it’s slow. 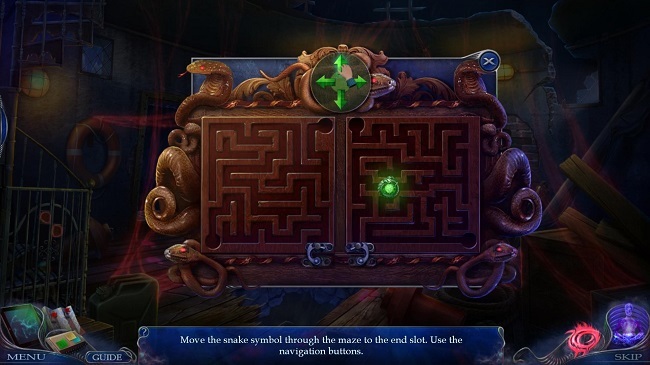 And maze games with two dead ends and no penalty for making a wrong turn is just busy work, especially when you have to navigate it using buttons on the screen rather than some more convenient method like… the mouse or the arrow keys on a keyboard. I realize that these days you optimize it for mouse and no doubt eventually a touch screen for the inevitable mobile port but that doesn’t mean you can’t include other methods in THIS version. Seriously, I have a keyboard right in front of me, allow me to use it AND include other methods of control as well. This really shouldn’t be that hard. This is not just presented at GrandMA games, this is a general trend I’ve noticed with HOPA, especially the more “modern” they get. If there is no risk of failure then there’s simply no great reward. Despite giving players a plethora of methods to advance (Hint/Skip function, walkthroughs and very helpful instructions popping up every few seconds), it still seems like developers are scared of challenging the players. And that simply wasn’t the case in the past. Super difficult sudoku-similar puzzles or simple mathematical equations to solve or puzzles that require you to plan ten moves ahead. 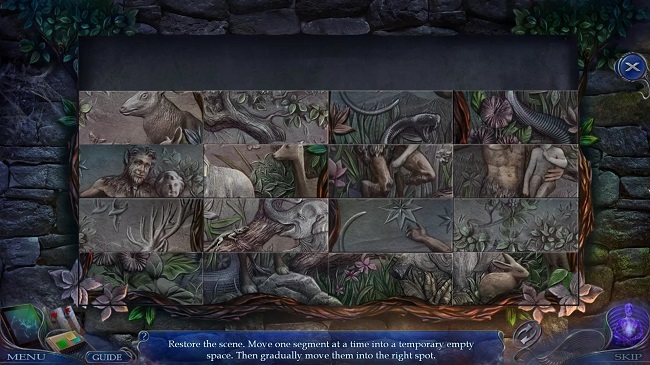 Every time I come across these types of puzzles, and there were some even in this game, I get almost giddy. And if you’re that scared of challenging puzzles, why not have an actual option for puzzle difficulty in the multitude of game options that make virtually no difference? Hell, you can turn off penalty for misclicking in hidden object scenes too many times! If all you want to do is make a pretty story, make a visual novel. It’d probably be cheaper and you’d find a hell of a niche market just begging for good ones. Again, not a slight against this game. Though it is guilty of it, there were a handful of puzzles that actually did challenge me and even one that I almost felt tempted to skip. And as always, guess what, it felt great! I love teetering on the brink between skipping and persisting. It’s a wonderful feeling and it feels twice as good to then rally and solve the puzzle. I’m telling you, it’s okay to push your players. Most will thank you… eventually. Why is it that all of my reviews end up sounding negative. It’s certainly not my intention. I love HOPA with all of my heart but that also makes me that much more sensitive to its flaws. And there ARE flaws that I would like to see eradicated. I fully support the inclusivity in HOPA but there is such a thing as setting the bar too low. At the very least allow players to set the bar at their preferred height. But for now, look at the pretty picture! The art is just so damn beautiful. So then, what else can I complain about? Well, I’m glad that you asked. What perhaps disappointed me about this game was that after the initial setup, you don’t really do a lot of detectiving. You just go from place to place, stumble upon the next clue to guide you to the next location only to be confronted with out of place puzzles. Hey, at least this game has an excuse for the weird puzzles because of its “Unseen” world. Well, I touched upon this before when I talked about what you do in the beginning: building a casefile. 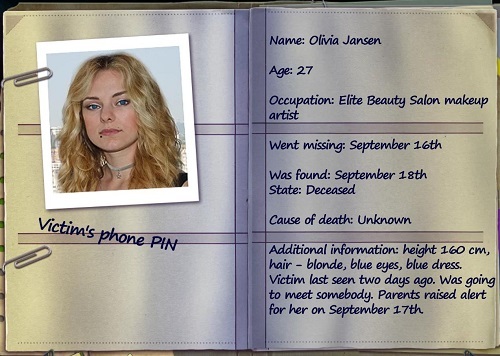 Granted, it was nothing overly complicated, just find the objects and put them in the casefile. It was simple enough but I just sort of assumed that was what the game was going to be. A string of murder scenes, investigate and find the clues then make deductions. The game teases you with five other murder scenes and victims yet none of that really plays into the next couple of hours of gameplay. Instead we’re pretty quickly told who the villain is and after that it’s just a long string of locations to get to the villain. Your sight ability become so typical that I hardly noticed using it and it never really reveals anything too groundbreaking. And to add insult to injury, while the first crime scene is depicted in all its gruesomeness, the remaining game is surprisingly tame. Sure, you see a couple of dusty old skeletons and get attacked by shapeshifters so it’s perhaps not for the weak of heart. But nothing ever really measures up to that moment when you pull of the tarp covering the victim and see her in her… final state. It’s just not there anymore. Kind of lost in the core of a somewhat generic HOPA. What this game reminded me of then was Adam Wolfe, the episodic HOPA from Mad Head Games that I reviewed a few months back. The setup is eerily similar but ultimately I find that Adam Wolfe does it better if only because it actually does the “multiple cases”-thing I was hoping for here. In fact, Adam Wolfe was released in October 2016 and this game came out about six months later? Coincidence, I think not. But if you’re gonna take inspiration from another HOPA, I’m glad it’s Adam Wolfe. The more adult approach and the sprinkling of actual horror is something I’ve seriously missed in HOPA for the last few years. The plot is nothing special and they could’ve done much more with the setting than they did but perhaps that is what the sequel is for? Truthfully, I enjoyed “The Unseen Fears: Body Thief” a great deal but the flaws were evident, at least in my eyes. Some people may not have the same issues I did but if you’re looking for a damn solid HOPA, you can do a lot worse. It won’t change your world but you’ll no doubt enjoy it. On Thriller Mode, anyhow.